Since October 1998, the American Geosciences Institute has organized Earth Science Week, a national and international event to help the public gain a better understanding and appreciation for the Earth Sciences and to encourage stewardship of the Earth. This year’s Earth Science Week will celebrate the theme “Discovering Careers in the Earth Sciences.” Many of the activities associated with Earth Science Week can be found at: http://www.earthsciweek.org/. Also, be sure to watch the NRC Chairman’s video about her experiences as an earth scientist. Earth science, also known as geoscience, is a broad term for the sciences related to study of our planet. Typically, earth scientists use tools from physics, chemistry, biology, and mathematics to build an understanding of how the Earth and its related parts work, how it gradually developed into what we know now, and how we can improve our quality of life. 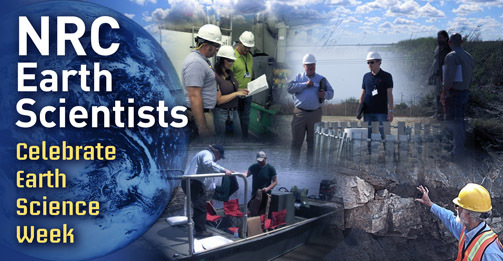 The major disciplines of earth science at the NRC include geology, geochemistry, geophysics, seismology, hydrology, engineering geology, marine science, atmospheric science, environmental science and soil science. NRC’s earth scientists play an important role in carrying out the NRC’s mission of protecting public health and safety. We work in teams and are key contributors to ensuring that commercial nuclear facilities are located and licensed to operate safely. We also take a proactive approach to address issues that may affect nuclear facilities in the future, like investigating the possible impacts of global climate change. Earth scientists participate in the NRC’s on-going efforts to identify and prevent incidents at nuclear facilities by examining potential consequences of events like hurricanes, tsunamis, floods, volcanoes and earthquakes. Nuclear reality and money concepts of pinching every penny during and after construction in the operations, so what does earth science see in nuclear reality of ice age rebound happening right now. What emergencies are in place when coastal areas & islands start sinking … and land mass lifts up earthquakes and land separation cracking flooding sink-holes. The reactors might fair well what about all the nuclear waste reality of storage facilities? What reconsiderations are there for such events. CaptD, you are one fearful fellow lapping up anti-nuke Kool-Aid, really. Check our AtomicInsights,com for a good cold dose of nuclear reality. Think shaman throwing bones and trying to decipher the future! Fukushima proved that Nature can destroy any land based nuclear reactor, any place anytime 24/7/365 and all the mathematical modeling in the World cannot change the FACT that even if something has a once in a thousand year probability, IT STILL CAN HAPPEN TOMORROW! Ask The Japanese, they’re now paying for a Trillion Dollar Eco-Disaster because they believed their Nuclear Professionals knew far more than they did, when they claimed that nuclear energy was 100% safe!